You don't normally have to clean your cat's ears, but if he has ear mites, bumps or scabs, you may have to help. Draw a stick figure cat. (No, seriously. Do it.) You probably included triangle ears -- they're one of the animal's representative features -- but you probably didn't add mites, bumps and scabs. They shouldn't be there, of course, but if your cat's ear issues eclipse caricature, seek veterinarian advice. Cat ears are extremely sensitive. Their hearing range extends well above and below that of humans. Cats probably have keener hearing than dogs, many of whom rely more heavily on smell for hunting than their feline brethren. Like those of all mammals, cat ears have three anatomical structures: an outer, middle and inner ear. The visible flap -- it's called the pinna, if you want to get technical -- is where you'll notice a variety of ear issues as they develop. If you don't notice the inflamed, irritated skin on your cat's ears, the pin-head sized white mites that are causing it, or the yellow-to-black crusty discharge in your cat's ears, you'll still probably notice your cat has ear mites. You'll notice because the only time he stops scratching his ears is to shake his head. Schedule an appointment with a veterinarian as soon as possible. If left unchecked, ear mites' infestation can cause an outer ear canal infection, called otitis externa, which can lead to other health problems, including deafness. Ear mites are extremely contagious -- the usual suspect is Otodectes cynotis -- and often pass between and among pets, including cats and dogs. Quarantine affected pets, if possible. A number of nonmite ear conditions can cause bumps and scabs on your cat's ears, either directly or indirectly. Your cat may pick at polyps or other growths on his ears, causing irritation, hematoma (i.e. broken blood vessels) or open wounds. Fleas, overactive sebaceous glands and even stress can induce itching and scratching to similar effects. While some ear issues are site-specific, most affect both ears. Regardless of the cause, open wounds on your cat's ear can lead to infection and a litany of related problems. Your cat probably isn't going to like you fiddling with his ears, but proper cleaning and medication is necessary when he has ear mites, bumps, scabs or any combination thereof. Put your cat on your lap in a comfortable position, bracing his body with your arm and supporting -- i.e. securing -- his head with your hand. Pull back his ear flap and gently roll cotton swabs to clean away debris. If this proves too abrasive, try a wet cloth or cotton balls. Never, ever, breach the ear canal. If you see your cat digging at his ears, examine the flaps, but don't probe into the ears. Call a veterinarian instead. 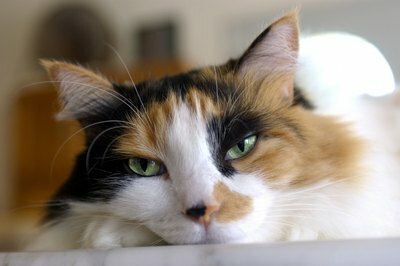 Is Tresaderm for Cats Used for Ear Mites? How Does the Rotation of a Cat's Ear Work? How Do Cats Get Ear Mites? Does Cat Ear Mites Make Lumps Under the Skin Near the Ear?